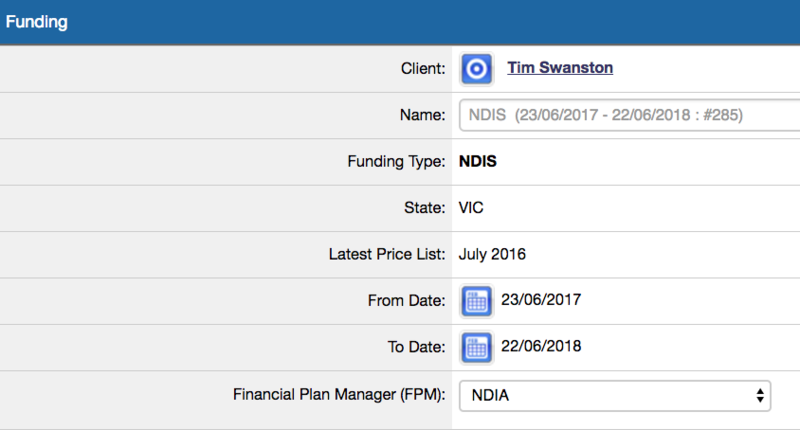 NDIS Funding is a default Funding Type in SupportAbility and has, for the most part, been configured for your organisation. There are however, some things that must be configured in order to utilise this inbuilt functionality and set up invoicing for the NDIA. 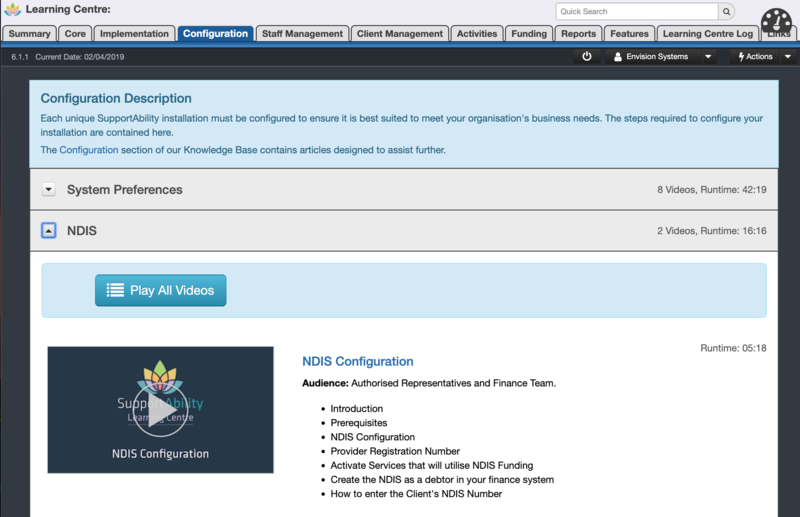 In addition, if your organisation wishes to use the Client Support Log feature whereby Clients may confirm receipt of the NDIS Support Items delivered in the Direct Services provided via Activities, and in particular the Client Support Log via Digital Signature, there is some configuration required to set this up. 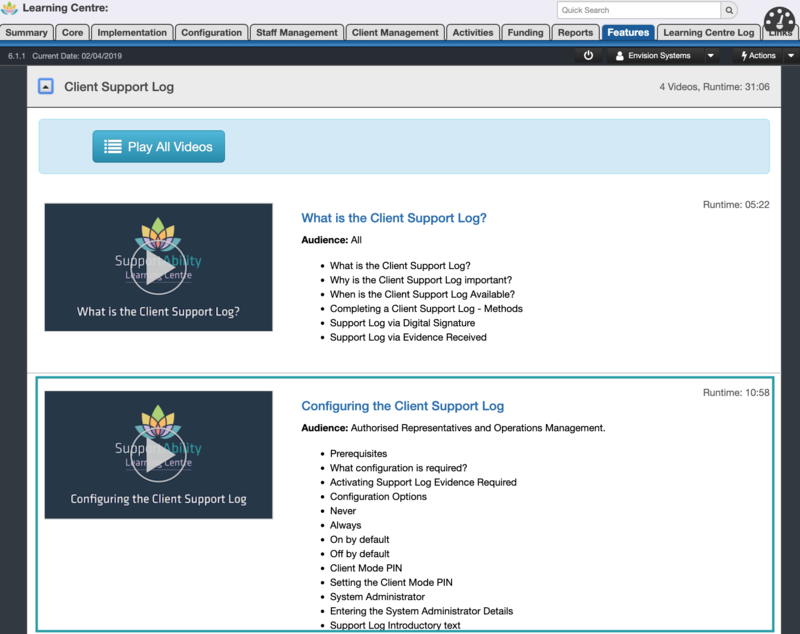 For more information regarding this feature, please review the What is the Client Support Log? video by selecting this link, or via the Features section of the Learning Centre. Alternatively, related articles have been linked at the bottom of the page. It is imperative that your organisation has considered how Invoice Batches will be generated, and specifically how Invoices for the NDIA should be processed and managed. The Finance Integration Strategy article discusses the different options available and how most providers choose to manage this. Finance Configuration must be completed in order for Invoices to be imported into your organisation's Finance system. For more information regarding what is required, please review the Finance Configuration article. To perform configuration in System Preferences, Staff require the 'Edit System Preferences' Staff Account Privilege. N.B. 'Client Funding Over/Under Spend Warning Thresholds', 'Cancellation and "no show" management' and the 'Support Log Introductory Text' features were not available at the time this video was created and are hence not included as yet. It is recommended that the NDIA is created in your Finance system as a debtor if invoices for Agency-managed Client Funding are imported (based on your chosen Finance Integration Strategy as outlined above). Enter your organisation's NDIS Provider Registration Number. The Client Funding Over/Under Spend Warning Thresholds used in the Utilisation tab of the NDIS Direct Client Funding record. The reduced price percentage your organisation wishes to charge in the event of a Cancellation or "no show". The Services that can be paid for using NDIS Funding must be activated. The Client's NDIS Number must be entered in the Administration section of the Client Details tab. Further to this, it is important to understand what is required for any Clients who have a Plan Manager or are Self Managing their NDIS Funding. If your organisation wishes to import these invoices, the NDIA will need to be created in your organisation's finance system as a debtor. If your organisation uses MYOB, enter the corresponding Card ID in the Debtor ID field of the NDIA Contact record in SupportAbility. If your organisation uses Zed Axis for QuickBooks or Reckon, the corresponding QuickBooks or Reckon 'Card ID' must be added to the 'Debtor ID' field in SupportAbility. If your organisation uses Xero, be sure to create the NDIA record with the same name as the record in SupportAbility, as XERO matches the data by entity name. Providers will need to set their NDIS Provider Registration Number/s in the Settings tab in System Preferences. This populates in the Bulk Payment Request file generated from SupportAbility. Several of the Budget Utilisation tools in SupportAbility provide indications that the Client is underspending or overspending against a given Budget or Expenditure target. In cases such as this, it is important to highlight when a significant variance from the Support Budget or Expenditure target exists. Whereas minor deviations may be regarded as normal and not flagged. To facilitate this, SupportAbility provides Client Funding Underspend and Overspend Warning Threshold settings, that may be configured from the default to your organisations desired warning tolerance levels. Please review the Client Funding Over/Under Spend Warning Thresholds article for more information including instruction on how to complete this configuration. The reduced price percentage your organisation wishes to charge for Category 1, 4 and 15 NDIS Support Allocations can be configured in the case where a cancellation or "no show" occurs. This is set to 90% by default and can be configured between 0 - 90%. no Client Support Log exists. The Client's NDIS Number must be entered into SupportAbility for all Clients paying for Services using NDIS Funding as this identifier is included in the Bulk Payment Request file export generated from SupportAbility. For any Client's who have a Plan Manager managing their NDIS Funding, a Financial Plan Management (FPM) contact record for these Plan Management organisations must be created, in order for them to be available to be set in the Client funding record. the new Creating an NDIS Financial Plan Management (FPM) Contact video. It is important to ensure the Client Billing Contact is correct for any Client's who are self-managing all or part of their NDIS Funding Plan or have a Plan Nominee managing their funds. Please review the linked article for more information about setting the Client billing contact. An organisation wide 'Client Mode PIN' must be created in System Preferences. The System Administrator details in System Preferences must be accurate. This important contact information will be displayed if staff have forgotten the Client Mode PIN. Review the 'Support Log Introductory text' in System Preferences. This text is displayed when a client, or their nominee, is completing a Support Log via Digital Signature and this can be amended as required.